The consensus was Virginia would get this deep into the Big Dance. If anyone figured they'd be playing Auburn in the semi-finals, it only woulda come from the Auburn locker room. And, whaddaya know, the Tigers willed themselves to earn their first trip to the Final Four in their history. What's more, dudes deserve it. It's still an uphill climb, though, in the eyes of those who set the numbers. 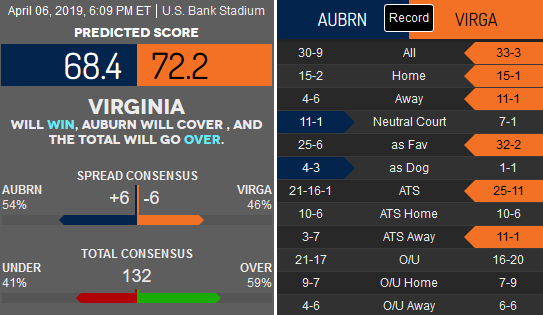 Bovada has set the line at Virginia -6 with a grinder's total of 133 and a moneyline of Auburn +215 and Virginia -260. The Tigers haven't struggled since the first round when they held off New Mexico State for a 78-77 win. Dudes flipped the switch in their Round of 32 game, dominating Kansas, 89-75. They then put a beating on the Midwest Region 1-seed North Carolina, 97-80, before forcing overtime against SEC rival Kentucky and prevailing, 77-71. Face it, knocking off the Jayhawks, Tar Heels, and Wildcats in the same tournament is beyond impressive. Auburn's been doing it with steals (6th nationally), dropping bombs (445 made are tops nationally), and balanced scoring. If they can get out and run, so much the better. It hasn’t been pretty, but the Cavaliers have played well enough to become one of the last four teams standing. Virginia maneuvered through Gardner-Webb, Oklahoma, Oregon, and Purdue. But, the only team they covered the spread against was Oklahoma, defeating the Sooners, 63-51, as a -10.5 favorite. The 'Hoos struggled against Purdue in the Elite Eight, needing a last-second shot in regulation to extend the game. There, they outlasted the Boilermakers, sealing the deal after Purdue point-guard Carsen Edwards made an errant pass towards the end of overtime. Virginia also typifies a total-team scheme, especially on defense. If they can impose their scheme consistently, they'll have a strong edge. Virginia saw Purdue get a good portion of its scoring from long range while dropping 75 points on them. Auburn shoots more threes and at a better percentage than Purdue, so that's gonna put big pressure on the Cavs. The Tigers prefer to run-&-gun. They get down the floor faster than any team they’ve faced in the tournament. They’ll do it again against Virginia, as well, and either make layups, dunks, or get open looks behind the arc. However, dudes proved against Kentucky that they can win a slower-paced game, which could be how this one plays out. Taking the points seems the obvious play, and picking Auburn on the moneyline is there for those who wanna go for gold. Result: Virginia 63 Auburn 62 ... Tigers cover ATS; Cavaliers cover Moneyline.